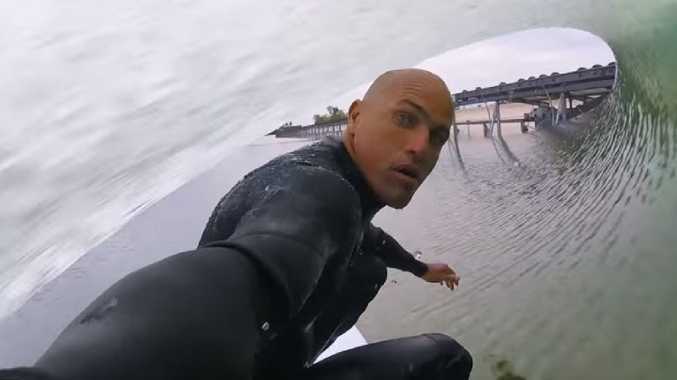 Kelly Slater, the greatest surfer of all time, will quit at the end of the 2019 world tour. JUST hours after Australian Joel Parkinson announced his retirement from competitive surfing, Kelly Slater has revealed he won't pursue a historic Olympic gold and plans to call time on his career in 2019. Surfing's greatest of all time said he would contest the 2019 world tour before bowing out of the competitive arena. Slater is at the J-Bay Open in South Africa, competing in his first world tour event since sustaining a foot injury that sidelined him from the tour for the best part of a year. Like Parkinson, who will finish his career at the Pipe Masters this December, 11-time world champion Slater plans to use the same Hawaiian event in 2019 as his farewell contest. Slater, 46, has won an extraordinary 55 tour titles since his first success back in 1992. While now the oldest surfer on the world tour, he was his sport's youngest world champion at just 20. He won his last crown when he was 39. "He (Joel Parkinson) kind of beat me to it," Slater told commentators in South Africa on Monday night. "I was already retired when Parko started on tour - literally. I think the first year he was on Tour was my first year back in '02. "I'll make an announcement. My basic plan is to get myself really healthy, get ready for April next year and make next year be my last year on Tour and just be done with it."